Well, I already had the unenviable task of attempting to talk about AC/DC’s Highway to Hell to interrupt my plan to avoid the trap of exhaustive coverage of classic albums, but hard rock is a genre that, as a whole, receives less attention and writing anyway. It’s sort of a niche market, in its way, even as it has achieved a huge level of mainstream, average-listener kind of success. It still hasn’t really encouraged a bunch of writing or the kind of pontification that truly defines “Best Records Ever Recorded” lists and books (even if it shows up in them, it’s not as often with loads of essays behind it). Now, I’m about to hit a slew of trouble, which begins today with being volunteered to discuss the 1969 sophomore effort from The Band, self-titled, and occasionally referred to (apparently!) as the Brown Album (not to be confused with all the other “Brown Albums”–some more ‘official’). 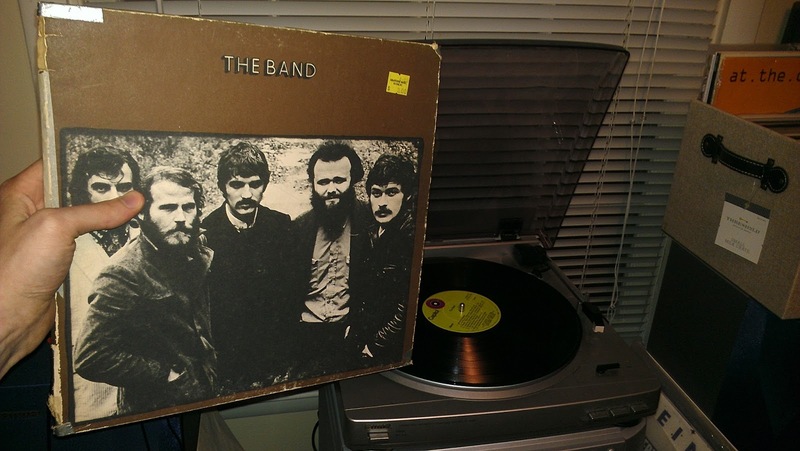 The Band is a peculiar subject: I am often reluctant to talk about them for fear of either being stuck in a “Who’s on First” routine or being subjected to an onslaught of Robbie Robertson hatred. I came to The Band through Robbie Robertson, as I grew up hearing his first few albums a lot in my childhood. I also get confused, sometimes, about the fact that “The Night They Drove Old Dixie Down” is often thought of first with The Band, despite “The Weight” remaining their song with the most penetration and familiarity–though, admittedly, it remains a song not as readily identified as being by The Band if asked of a random non-music-obsessed kind of person. Sometimes, I’m left, then, with the notion that I’m some kind of shallow musical luddite when it comes to the band, resistant to the notion that Robertson didn’t write as much as he’s credited with (for the record, a claim I’m not at all strict about, one way or the other, though I’m inclined to think the totality was certainly a group effort, musically). Let’s really just get this out of the way: this is one of those discussions I really don’t want to get into. As much as I think financially Robertson may have taken more credit (and in a way that gave more financial recompense) credit than was earned, I think the endless slamming (at the least, with regard to music) is unwarranted and a result of “baby-with-the-bathwater” mentalities. Let’s leave it at that, shall we? As I rarely process artists I’m unfamiliar with in reading beyond names sticking with me, my first exposure to The Band came with their debut, Music from Big Pink, though I rapidly sped through at least the next few (eventually slacking around Cahoots, a stopping point I’ve never successfully reminded myself to restart from) as I had the immediate access to my dad’s own record collection (which is rather robust, insofar as The Band, for instance). I was still in high school, I’d taken a shine to his Robbie Robertson CDs (all four of his then-released albums, including my probable yearlong affair with 1998’s Contact from the Underworld of Redboy), and I was often found parsing through his collection for the songs I’d heard on the radio, associating their artists and listening more heavily–often slowly expanding my listening throughout the albums those songs came from. It’s no surprise then, if one puts all the information mentioned together, that I started with Big Pink, as it’s where “The Weight” came from. For a long time, The Band was semi-ignored in my personal musical canon. It wasn’t a bad album, it wasn’t an okay album, but it wasn’t one I’d feel myself drawn to. Maybe it’s that brown cover with a monochrome picture of the boys looking dour (except Garth Hudson, anyway),¹ I don’t know. I’d often listen to it in my usual digital way: put on the earliest released track I had by an artist, and let it just play on. I’d enjoy it, but I associated it with “The Night…” and “Up on Cripple Creek”, which I had learned were the big singles/songs from it (“Night” was a bigger hit for Joan Baez though, apparently), and I liked them well enough, but not as much as I did “The Weight” or “Tears of Rage” or “This Wheel’s on Fire”. When I bought this copy–as best I can tell, from the original pressing, thus the duct-and-masking-taped-together look, a condition many of my 40+ year old records share–I was in college, and it was The Band, and it was $3. No, it’s not in fantastic condition as a record, either, but it lacks locked grooves, severe noise or any other major distortions. Just lots of nice pop and crackle. The band (or The Band, or The Band, take your pick, I guess) opens with “Across the Great Divide”, an anticipatory intro of piano, horns and Richard Manuel’s vocal, the music itself seeming to hold itself back, each note beginning with punch, and then it holds, and in comes Rick Danko’s bass and Levon’s drums, with just a bit of organ that grows to layer the background from Garth. The song begins to bounce along, pressing only at the end of each line of the chorus. It has a swinging–I don’t mean swing music, just swinging–sort of feel that is indicative of the atmosphere of the album as a whole. Rick Danko’s violin (well, let’s be honest: fiddle) intro almos defines “Rag Mama Rag”, and is just achingly perfect in a way that a handful of moments on this album are. The ragtime-y piano from Hudson replaces it, largely for the majority of the song as Levon sings with dragged syllables over the beat he lays down, becoming a big, well, raggedy over the chorus, drawing out “Rag” and singing “mama” quickly. Rick sings a brief bridge, but the latter half of the song is dominated by Hudson’s restlessly wandering fingers. There’s always been something vaguely uncomfortable to me about “The Night They Drove Old Dixie Down”, but something that is captured in a lot of my reaction to certain segments of Southern culture. I’m eternally grateful to Patterson Hood (of the Drive-By Truckers) and Jason Isbell (formerly of the Drive-By Truckers) for helping me to grapple with this (in ways that would take too long to explain here–we can save that for when I get to records from either). I’m always wary of the kind of romanticism about Old Dixie exhibited here, considering associations–I always have been, even as a child. Yet, like Robbie describing the second time he heard “The South will rise again”, saying it touched him, that he heard a “a pain there, a sadness there”. The song has all the right elements for the attitude it conveys: Richard Manuel is back on the keys, and brings the song in from the bottom end, a lick used later to return from the chorus to the verses, and rhythmically carries the song along with Danko’s bass, as the song is all about Levon’s vocals and the story he’s telling–whoever wrote the lyrics, there is no doubt whatsoever that Levon is the right singer–which is about the South, and “the winter of ’65/We were hungry/Just barely alive”. He sings as Virgil Caine, who assists the Confederate Army and talks of the final fall of the Confederacy–with pain and sadness, but the respect and (wounded) pride that defines the feeling that lingers. Robertson’s guitar adds just the right upward bend to his moments–mixed somewhere in the middle, rarely in the front–to give that contrast that defines the tone here, but with a strong attack on each note in the chorus–and that chorus! Levon brings a string of rolls in to a chorus that limps like his drumbeat for the song, even as the Band’s collective voices rise to unison for the chorus. And Levon always leads into it perfectly: the verses have his voice following each beat with a syllable, and then holding on the last word before the rolls and voices carry us up into that sorrowful pride. Whew. I know I didn’t intend to spend any of this blog writing about a single song, and I just mentioned that song is not a favourite of mine–but it’s so damn well put together! We get a relief from the tension and loss of “The Night…” with Rick Danko’s vocal lead on “When You Awake”. Rick’s voice isn’t the “angelic” sound of Richard Manuel (and that’s a common adjective for him), though Manuel co-wrote (or wrote, or whatever) this song. It does continue the feeling that “Across the Divide” and “Rag Mama Rag” largely establish: we’re listening to a band playing for some sort of town celebration–all the best players in town coming together to jam out some songs for the close of a harvest festival or something of that nature. It’s not the feel of “quaintness”, it’s the feel of uncorrupted musical performance; there’s something intimate and comfortable about the album, that is represented by a cover photo that isn’t carefully arranged (in feeling), and is very “to the point”–it’s like the collected recordings of a group of musicians not out to be recorded musicians. “Field recordings” of stunning quality, but with a few odd touches of clearly studio-required effect. Now, The Band are masters of the introduction to songs. “Chest Fever” has one of the most amazing organ parts I’ve ever heard, like Garth Hudson is head of his own church, lost in a fever of–but, I digress. “Chest Fever” isn’t on this album, it’s on Music from Big Pink. Now, “Up on Cripple Creek” is on here, and that intro from Levon’s dry and funky drum and Rick’s ridiculously dirty, funky bassline that is perfectly accented by the upward turns of Robertson’s guitar–fantastic stuff. I always forget that, as it is in keeping with the rest of the song, but it lacks the organ and wah-wah’d clavinette (!) of Hudson, Levon’s vocals and the more appropriately upbeat bass of Danko that defines a chorus that rides its chorus happily. It ends with a great lead from Robbie, too, but has never transcended itself successfully enough for my tastes to call it a “favourite”–just a damn good song, and one I can’t blame anyone else for marking a favourite. Side One is closed out with “Whispering Pines”, which is probably the best song for a side-closer on the album. It has the falsetto-oriented, wavering vocals of Manuel, as well as a whole slew of keys under it–an electric piano from producer John Simon, organ from Hudson, and piano from Manuel himself. It’s one of the more relaxed songs on the album (thus its quality as side-closer). As is often the case, Manuel’s vocal is vaguely ethereal, the wispiest voice of the group. Side Two opens us off with the most emphatic guitar riff of the album in “Jemima Surrender” (which I have to admit I can’t help but associate with syrup automatically). The riff seems to try to repeat and emphasize it’s point, as if it is restarting as it goes, being played between every few lines of the verse, but it’s let free to give Robertson room to breathe, instrumentally and throw in some great moments. The song shifts briefly for a bridge that sounds just great, led back into the rest of the song by that riff–only now accented by horns. And then, unexpectedly, we hit my favourite swath of the album, starting with “Rockin’ Chair”. Levon moves to mandolin, Hudson to accordion, and the song has the flittering, hanging feeling of much music associated with those instruments, which all fades to an isolated set of deliberately notes picked out by Robertson (with just a little tip of the hat from what I think is Hudson’s accordion). John Simon plays tuba under the whole thing, but it’s all about–for me, at least–the chorus: “Oh, to be home again/Down in ole Virginny/With my very best friend/They call him Ragtime Willie”. While the verses are led by Manuel, the chorus is sung by him, Danko and Levon in unison, with a faltering rhythm that gradually moves to a smooth one that holds and seems to drift off into the air. For reasons I honestly can’t quite fathom, I associate the song with a Warren Zevon favourite–“Play It All Night Long”, even if Zevon is, as ever, darker (by a long stride) and speaking of Alabama, not Virginia. Don’t ask me–something just clicks. “Look Out Cleveland” has another one of those fantastic moments: it begins with a driving piano intro and a guitar riff that just strikes again and again (like some early rock tracks), before Levon comes in riding his cymbal and a sliding bassline from Danko. But then it turns on a drum fill that stops suddenly on a ringing, open version of that guitar chord, Levon’s cymbal ride only gradually coming back up to volume, as his voice calls out, “Look out Cleveland, the storm is coming through/And it’s runnin’ right up on you”, the ringing guitar chord dropping as it strikes on each beat and is let ring. The verses then turn to a more familiar feel of a band let loose, before that chord comes back again, ringing out and letting that chorus seem to slide upward on a gradually increasing curve toward an apex that is actually a plateau. I really cannot say enough about that chorus–just perfectly done. I often forget “Jawbone”, as it opens on flittering piano that turns into weird, rising unison vocals from Levon and Manuel and turns to a rather steady, piano driven verse. But the music drops and Manuel gets out “I’m a–” alone before the instruments come back to emphasize the next word: “thief,” and follow him for the rest of the line: “and I dig it”, when the bass and keys seem to get stuck and repeat themselves, the rhythm somehow just perfectly emphatic, and then follow him for the rest of the chorus: “I’m up on a beef, I’m gonna rig it/I’m a thief and I dig it”. That chorus, again, is just something. It tightens my chest, like a welling of pride–a moment that I just love, like a high to be chased, without the risks that a lot of highs can bring. It’s held for just the right amount of time and couched in a solid but otherwise unspectacular song. And, good lord, Manuel, the way he sings those lines–like he poured his whole damn soul into them. And then the chorus drops us at the feet of one of the best solos from Robertson on the entire album, one of the few moments he is given the auditory spotlight, before he blends back in for his tasteful tweaks and licks within the song. “Unfaithful Servant” is another good side closer, relaxed, with paired saxes from Hudson and Manuel–but the only time Hudson plays a soprano, allowed to run with Manuel’s baritone. And damn if that isn’t the best solo from Robertson on the whole album: high, rapid notes that turn slow and sweet and bend at just the right places, eventually just becoming an exquisite set of notes. And that’s the feel overall: it’s a group of musicians, not fighting for a group spotlight, or even individual spotlights musically. It’s a group of skilled players gathered and playing loosely but in a pre-determined fashion. 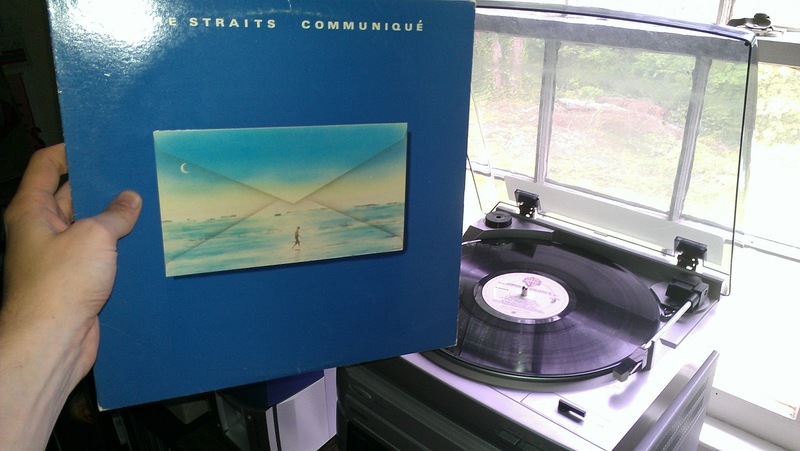 I was inclined, originally, to wag my finger at everyone for dumping an album like this on me–especially when Stage Fright is my favourite Band album (largely attributable to the title track, and a closer that reminds me of “King Harvest (Has Surely Come)” in some ways). That’s really, I guess, the point of doing those polls: while on some level I want to tell people about things they don’t know about, it’s nice to have myself pushed in a direction I might not have gone in. It makes me listen and pay attention and describe something I wasn’t originally going to. And I get to learn something to–and that’s always fun.